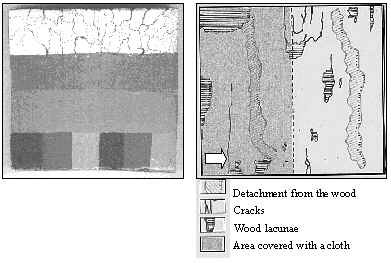 Frescoes and icons show analogies in terms of defects, both present layer-to-layer detachments and delaminations and surface cracks; the aim of this work is to present the development of a diagnostic system for the measurement of the defects position and size. After initial measurement set-ups based on accelerometers and impact hammers a novel system based on laser vibrometers and acoustic stimulation of structures to allow full remote and contactless investigation of detachments and delaminations is proposed. A measurement procedure based on two subsequent scans of the work of art has been defined: the first scan aims at finding defects positions the second one at characterising their resonant response. One of the most important problems in every kind of mechanical measurement is to provide an adequate excitation of the object under study. In this work we will present four different kinds of exciters, namely a coaxial loudspeaker, a horn loudspeaker, an acoustic mirror and a piezoelectric actuator, showing some experimental results obtained employing each of them. Moreover a comparison with natural excitation sources will be carried on. Also an on field measurement session on large sample walls will be described along with the results obtained that show how efficient this technique has become. This work is developed within the LASERART project, which is an EC funded research programme aimed at developing non-intrusive measurement techniques for the diagnostics of the state of conservation of frescoes and icons. These works of art are rather complex multi-layered composite structures, usually made up of many different materials. Therefore they are strongly inhomogeneous non-isotropic structures substantially unknown. At present, structural diagnostics of these works of art fully relies on the expertise of the restorer and the typical diagnostic process is accomplished mainly through manual and visual inspection of the object surface. The restorer knocks on the surface and then senses the surface vibrations with his fingertips while listening to the induced sound. 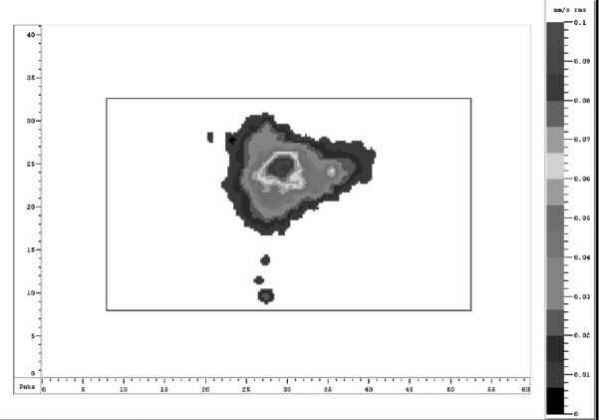 The response to these stimuli allows him to identify and characterise the defects. The most important limitations of this technique are the non-objective nature, the poor repeatability and the high cost. First attempts to translate this technique into a more systematic approach can be found in Esposito and Mannaioli . The basic idea was that defects could be identified as high mobility areas resonating at some specific frequencies; restorer's knuckles were substituted with impact hammers and his fingertips with accelerometers. Characterisation of defects could be done by finite element analysis of suitable models. Moreover Esposito employed acoustical excitation of structures (see also Bonarrigo ), a first step towards remote measurement techniques. Castellini, Paone and Tomasini [4,5] introduced the laser Doppler vibrometer as the remote sensing device substituting the accelerometers. A fully functional set-up employing acoustical excitation was developed thus completing a remote measurement system. Again Castellini, Paone and Tomasini  described this technique putting in evidence the role it could have to help restorers in their work. An updated report on this technique can be found in Castellini, Esposito, Paone and Tomasini  where also a first study of the intrusivity of the acoustic excitation is described. Other important defect detection techniques employing optics are described in Fricke-Begemann and Fotakis . They employ ESPI (Electronic Speckle Pattern Interferometry) and holographic interferometry respectively to study works of art, the latter describing also many other applications of lasers in this field. Based on our previous experience we have defined a general measurement procedure, consisting of two different stages, leading to defects identification and characterisation. Fig 1: Sample frequency spectrum of a vibrating structure. The first scan on the work of art is done by white noise excitation of the work of art and measuring the RMS value of surface vibration by the scanning laser Doppler vibrometer (SLDV); the result is a point by point map of the surface RMS velocity. The process may be very quick and the detached areas show as higher velocity ones. 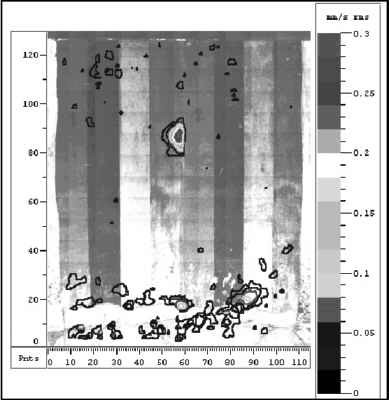 Fig 2b: Plate III analysis (b) vibration map at 3338 Hz. At this stage it is very important to look at the signal spectrum to note the presence of high amplitude structural vibrations (see "A" in the frequency spectrum in Fig.1) that could mask the useful part of the signal, i.e. small amplitude/high frequency local surface vibrations induced by a defect, for example an hidden void (see "a" in Fig.1). In general the signal from the laser head should be carefully high-pass filtered because of the common presence of very low frequency/high amplitude vibrations (for example those induced by a nearby road loaded with heavy traffic). In some very difficult cases a notch filter is needed to eliminate very high amplitude narrow band interfering signals, an example being acoustic standing waves in the measurement environment. After defects localisation it is possible to investigate the associated spectrum by pointing the laser, for example, at the centre of the detached regions. Employing an FFT analyser, resonance frequencies are identified and subsequent scans are executed looking surface vibrations at these same single frequencies (for example "a" again in Fig.1). Signal to noise ratio is greatly improved if compared with the one of a RMS scan although measurement time grows in a similar way. Resonance frequencies are also needed if one wants to study a model of the work of art by FE analysis. 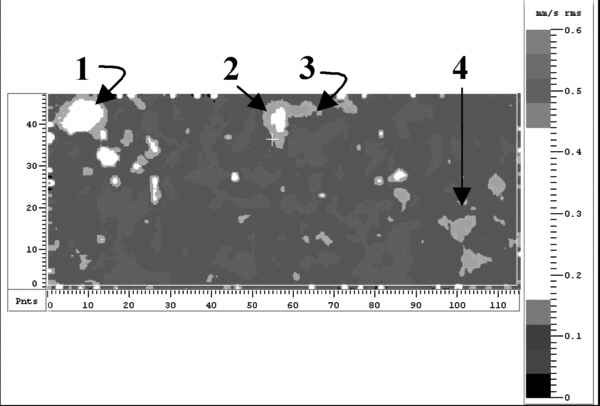 In Fig.2 a comparison of the same sample examined by RMS and FFT analysis is reported (plate dimensions are 240x160x25 mm). Defect shape is better defined with the former technique but signal to noise ratio is greatly improved in the second case. Moreover a general conceptual scheme of our measurement set-up is reported in Fig.3. Type a) exciter is very cheap and the available models are numerous. We decided for a coaxial car hi-fi one, rated at 30 W RMS power with a response extending up to 15 kHz. Cone speakers suffer for a series of deficiencies, mainly low efficiency, typically less than 1%, and poor polar (spatial) response. Anyhow they are ready to use devices very useful for preliminary measurements. As regards type b) we employ professional commercial speakers easily found in specialised shops. The efficiency of this category of loudspeakers is always above 100 dB/1 W/1 m and this allows the use of low power amplifiers. Anyhow we use 150 W professional amplifiers because of their superior reliability and to avoid strong signal clipping that could destroy the horn. Another important characteristic is the constant polar response of the horn so that frequency response remains almost unchanged over a 90°(H)x70°(V) irradiation lobe. The sum of these features makes horns ideally suitable for exciting large surfaces at large distances and in general to obtain high pressure levels. These devices are intended for professional use so they can stand long and intense stresses without problems; the only precaution is to filter adequately the input signal to avoid voice coil overheating and possible burnout. Type c) represents a tentative of overcoming some deficiencies of normal speakers and horns while at the same time keeping their main benefit, i.e. contactless excitation. The basic idea is to exploit the focusing property of elliptic mirrors to concentrate acoustic energy in a very small region of the object to be studied instead of dispersing it everywhere. A sketch of the focuser can be seen in Fig. 4. The speaker is positioned in front of the mirror exactly in its first focus (f1) while the specimen is in the second focus (f2) of the ellipsoid: in this way sound waves emitted in f1 reach f2 exciting vibrations. Mirror dimension must be at least 3 times greater than sound wavelength to concentrate energy so we decided for a minimum working frequency of 1 kHz to maintain mirror dimension to reasonable limits. The speaker is a soft dome hi-fi midrange standing a 100 W RMS power with a frequency range of 0.8-10 kHz. The mirror was realised in our laboratory and is made of a sandwich of seven fibreglass layers and a 1 mm lead layer to add mass and damping; total thickness is about 3 mm and the weight is approximately 5 kg. The reflecting surface has been coated with gel coat and accurately polished and all the structure is mounted on a detachable steel frame. To verify the mirror performance a measurement of sound pressure level (SPL) at SLDV operator head has been conducted maintaining a 90 dB SPL on the examined sample: a 10 dB reduction is obtained when employing the mirror instead of the horn (63.8 and 72.6 dB respectively), showing a significant reduction in the annoyance produced by the source. Type d) exciter was developed because there is a physical limit inherent in acoustical excitation, i.e. the great mismatch between sound waves and specimens (usually hard solids) impedances. Energy transmission is very low and only the very high sensibility of SLDV allows good measurements in this situation. 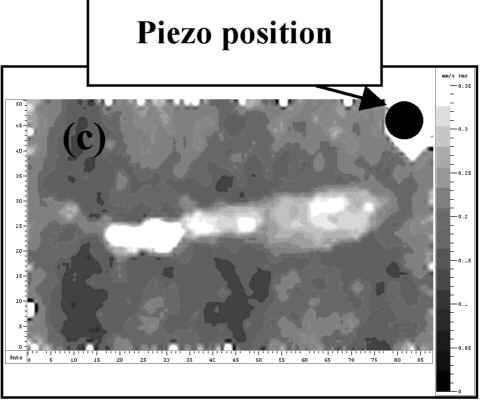 Mechanical impedance of ceramic piezo composites (PZT) is much higher than that of a sound wave and gluing small disks to specimens greatly reinforces mechanical coupling. Piezo disks are produced in a great variety of shapes, thicknesses and mechanical properties and we had to carry on a selection of the best suited for our scope. At present we use 10x0.5 mm PI GmbH PZT 151 disks, capable of exciting structures up to 2 MHz. Maximum voltage that can be applied is 1 kV and a 100 W custom designed amplifier to drive disks adequately has been acquired. Due to their features type c) and d) exciters seem best suited for detecting medium to very small defects although the last one is minimally invasive. f) crowds and live music. Type e) is the most common way of detecting voids and delaminations in works of art and we measured both time histories and spectra of human knocks on a fresco surface. A person knocking on a fresco sample will input about 15÷30 N/cm2 with a frequency range limited to less than 500 Hz. To measure the force exerted by the piezo actuator we interposed a load cell between it and the surface of a fresco sample and used a greater than usual voltage to excite it (200 V). Piezos are more efficient above about 8500 Hz with an overall value up to 20 kHz of about 0.5 N/cm2. Experiments both in the field and in the lab demonstrate that a useful range of sound pressure at sample surface is 80-110 dB, that is to say 0.00002÷0.00065 N/cm2. These pressure levels compare well with those usually encountered in typical fresco locations, e.g. churches, which were actually measured experimentally on fields; in this case spectra extends up to 3.5 kHz, a value seldom reached and only in particular situations (high pitch notes, people clapping). In Table 1 we compare amplitude and spectra of artificial and natural sources and we note that natural sources generally exhibit greater or comparable amplitudes but narrower frequency bands than artificial ones. We should mention an observation about the fact that human excitation sources are usually of the impulsive type, while we use mainly stationary signals. 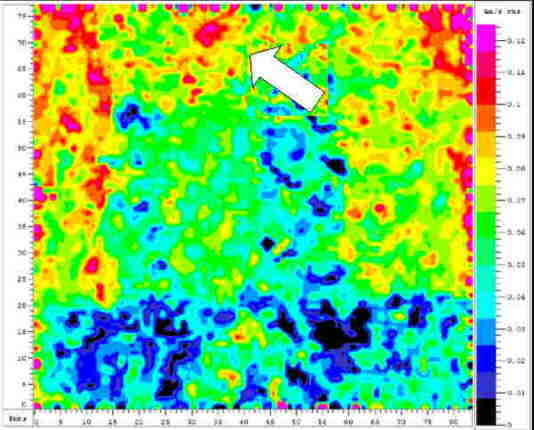 Fig 6:Wall n0 II, RMS vibration map. 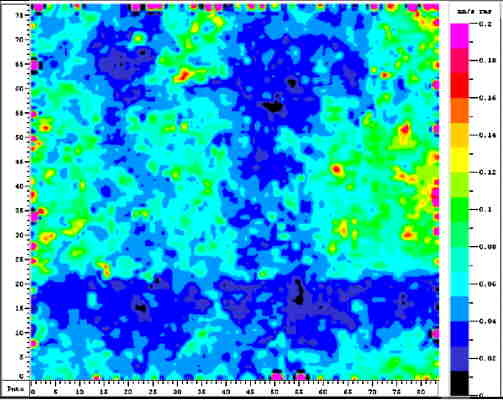 Fig 7: Wall n0 II, RMS vibration map. Contour view. Fig 8: Wall n0 II, RMS vibration map at 900 Hz. 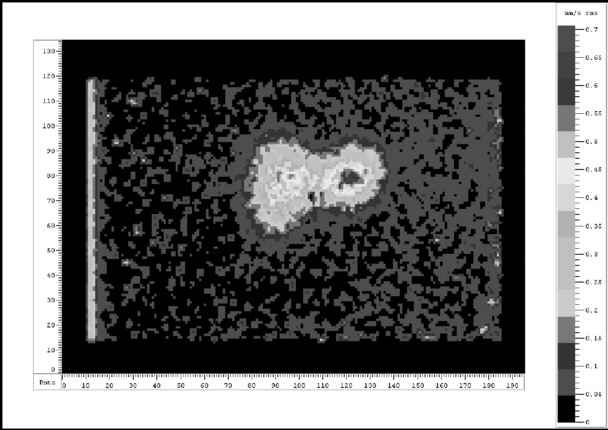 Fig 9: Wall n0 II, RMS vibration map at 1763 Hz. Fig 10: Wall n0 II , RMS of entire surface. Black dotted line marks at the edge of painting area. Fig 11: Wall n0 II at CSTB. Vibration map of entire surface at 462.5 Hz. 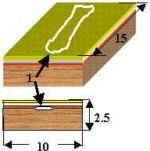 Fig 14b: Icon sample RMS map: (b) piezo at the back. 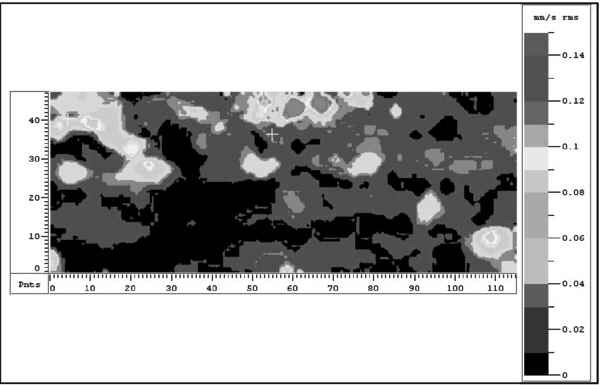 Fig 16c: RMS analysis of icon sample(c) piezo actuator. Sample 1) was studied using the horn loudspeaker while samples 2) were studied employing three sources, i.e. type b), c) and d) We always employed white noise as source signal, limited to 5 kHz for the fresco sample and up to 20 kHz for the icons. These bandwidth limits derive from our previous experience on many other samples and in situ measurements. In all measurements graphs white areas denote high velocity ones and so they may indicate the presence of defects. Twenty years ago ten large (2x1.4x0.5 m approximately) walls were constructed and then painted with traditional fresco techniques at CSTB location in Paris under the supervision of LRMH, the national laboratory of France for the study of ancient monuments. Through thermal and humidity cycles these walls have been artificially aged and they show most kinds of defects typical of ancient frescoes. We examined four of this walls employing acoustical excitation and then compared results with the defect map provided by a professional restorer who had previously examined these same walls. Due to the very large amount of data and images here we present only the results regarding wall number two. The first icon sample is 12x12x2 cm and is composed of five layers: a wood substrate, a canvas glued on the left half of the board, a gesso primer, a layer painted with pigments commonly used in ancient icons and a protective transparent varnish. The upper part of the object is also covered with a gold lamina. The second sample is 15x10x2.5 cm and is composed of four layers: a wood substrate, a canvas glued on the wood, a gesso primer and a uniformly painted layer. There is a single defect under the canvas layer and it extends along almost all the icon. These samples were prepared by a professional restorer of Benaki Museum, Athens (GR), that owns the largest private collection of Greek icons in the world. The defect maps were also furnished by the same restorer. In the following of the work we will not show results obtained with the standard loudspeaker because its performance was unsatisfactory when compared with other acoustic sources; anyhow it remains an handy and cheap way of exciting structures for preliminary investigations. 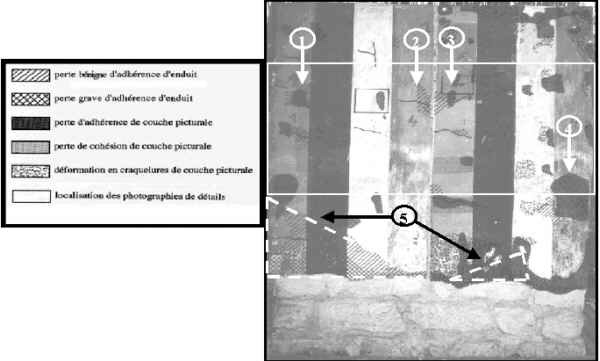 In Fig.5 we have a general view of the wall and its defects as reported by the restorer, while in Fig.6-11 we show the results of our measurements. Fig.6 presents a RMS investigation of a limited part of the wall, namely the one in the white rectangle in Fig.5, while Fig.7 shows the same results superimposed on an image of the wall itself. As it is evident defects numbered 1,2,3 and 4 are clearly identified as regions of larger RMS velocity (the original images are colour ones and defects identification is much more evident). Then the laser beam was pointed at defect 1 and a spectrum acquired from which we extracted some resonance frequencies. The fundamental one is at 900 Hz and its vibration map is presented in the next picture. Here we put in evidence a part of the original raw measured data to show how they follow quite closely the horizontal crack visible at the lower edge of defect 1: in fact the lower boundary of the vibration map is practically a straight line. Note how the velocity ratio between the defected area and the rest of the wall is quite high; and in this case also the shape of the defect is well traced. We repeated the same procedure for defect 2 and identified 1763 Hz as one of its resonance frequencies. 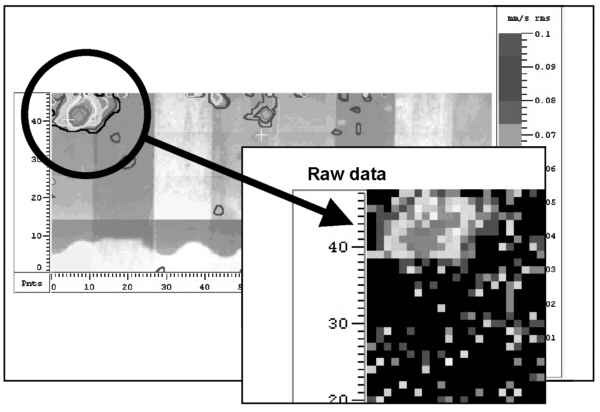 The result we obtained with the subsequent scan at that same frequency is particularly interesting because we note how even single frequency excitation can lead to multiple defects identification (see Fig.9). In fact all major defects are in evidence and an interesting characteristic of defect 1 shows up: its real area is larger than previously noted and extends to the right towards the crack in the white painted stripe and downward under the painted "1" where we have another crack (see Fig.5 to find these references). 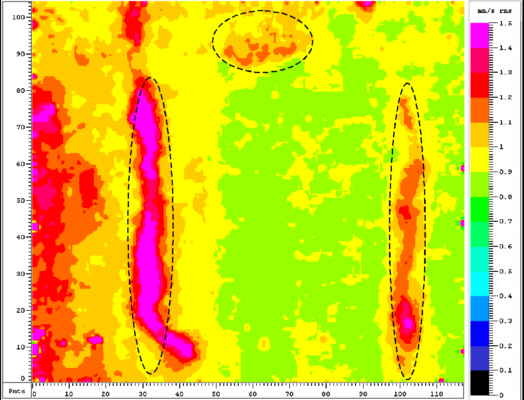 A global view of the RMS vibration map of the wall is presented in Fig.10 where defects 1 and 2 are particularly evident and moreover two triangular badly damaged areas (number 5) are clearly visible. These results match well the diagnosis of the restorer. Another interesting feature to be found in this picture is the high velocity zone inside the white dotted line. If compared with Fig.5, one may note that this area coincides with a part of the wall from which the plaster layers have detached completely so that the hidden stones came to light again. A close examination revealed that the moving objects were not the stones themselves but the mortar among them that is badly damaged and is reducing to dust in vast areas. All these freely moving parts give rise to the aforementioned high velocity zone. 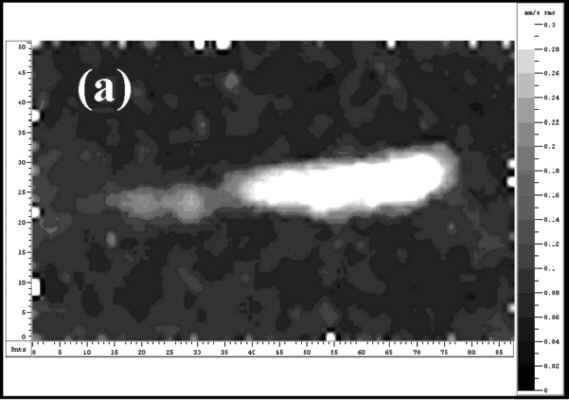 A single frequency investigation at 462.5 Hz is reported in Fig.11 with the laser aimed at the defect in the upper half of the wall (number 2). The defect stands out in perfect clarity and its right edge follows closely the track between the two painted areas of the wall. This delimitation was cut to put in evidence that these two painted halves were executed on two different types of plaster. A picture of the first icon sample is in Fig. 12 and is used as a reference to subsequent analysis. We present two series of pictures (Fig. 13 and 14), the first regarding RMS measurements of surface vibrations using acoustic sources, the second one is obtained by the piezo actuator, positioned respectively at the front side of the sample and at its back. 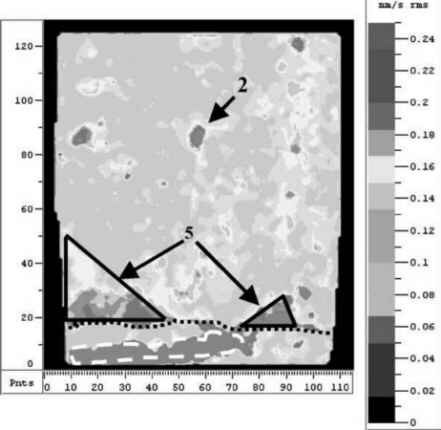 Acoustic sources are not capable of exciting the sample adequately, the maps are quite confused and only one high velocity area (white arrow in Fig.13 (b)) identifies the cracked zone at the top of the icon. The piezo actuator is glued to the sample and the vibrational energy is directly coupled to the icon making the defects vibrate and thus identifiable. In particular the two tunnel-like detachments are clearly visible along with the cracks at the top and the bottom of the icon (dotted black lines in Fig.14). Lateral dimension of both long detachments is about 4 mm. The canvas is also detached from the icon along the right edge, due to a lacuna, and this defect is identified, too (black arrow in Fig. 14 (b)). The second sample is depicted in Fig. 15 and measurement results in Fig. 16. The piezo actuator is still capable of exciting the structure adequately but in this case by using all three sources the induced defect is identified. The sample structure is simpler than the previous one and defect dimensions are wider (»10 mm), so acoustic sources may excite adequately the object. In general the use of piezos requires a direct contact with the object and the use of some fixing medium; the restorers of Benaki and the University of Ancona are co-operating to find the right glue that should be completely harmless to and removable from works of art. 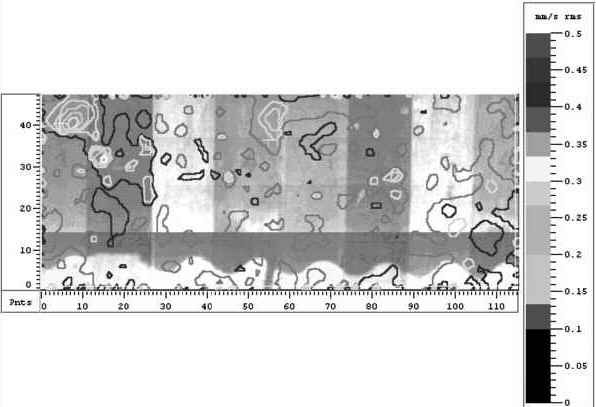 This work presented the latest developments of a novel measurement technique to discover and characterise defects in frescoes and icons, based on the different vibrational behaviour of defected zones when compared with safe areas. The core of the system is a laser Doppler scanning vibrometer that allows remote and contactless surface velocity measurements of mechanically excited works of art. A number of tests on different samples using three excitation sources out of the proposed four has been executed. Loudspeaker performance was too low when compared to other exciters so it was excluded from our work. In any case acoustic exciters are extremely useful because we can avoid any contact with the object under study. The horn is capable of detecting from large to very small defects, irradiates sound over a wide angle to excite large surfaces at great distances but can be very noisy and annoying for people around. The mirror overcomes this problem and can be used even in crowded rooms; its main drawback could be the fixed focus distance. However when employed with movable small objects (i.e. icons) this is not a problem anymore. In the future we plan to realise a new mirror with a parabolic dish. This kind of mirror is commercially available for satellite applications and we just need to add some damping material at the back to avoid unwanted vibrations. This kind of mirror should allow propagating plane waves towards the samples at great distances and thus should gather the advantages of horns and elliptic mirrors. The introduction of piezo exciters allows a greater deal of energy to be injected into works of art so that very small defects localisation has become far easier. We must study further the coupling mechanism between the piezo and the objects but the basic principle is that the piezo exerts a force on the object and makes it vibrate. Piezo have demonstrated necessary to study complicated structures like icons when they present small defects, unrecognisable by acoustic excitation. The use of special glues should avoid the problem of fixing them to works of art. Moreover the useful frequency band of these exciters is practically unlimited with respect to our needs, being in excess of 2MHz. The high voltage amplifier that drives the piezos imposes a practical limit but a full 20kHz band has been obtained with a custom designed amplifier. In Paris a measurement session was conducted on some large sample painted walls at CSTB and it was a very important test because these walls resemble quite closely real frescoes aged some hundreds years. Moreover this measurement session was the first conducted on much more complex and big samples than the ones we previously had in our laboratory. The great amount of data impedes a full presentation but the results obtained on wall number 2 demonstrate that our measurement set up and procedure can lead to a precise identification of defects locations and comprehensive characterisation. No one of the three actuators seems to depend on sample material characteristics but this side of the problem must be studied further, especially in the case of the piezo actuator. No one of the three actuators can satisfy all the needs of a measurement system but the combined use of them allows detection and characterisation of many kinds of defects. In table 2 we present a summary of each artificial exciter characteristics. Table 2 - Artificial exciters performances. (*) This applies to present samples. PZT does not work well with plastics, for example PVC. The EEC-Standard Measurement & Testing programme under contract Laserart-SMT4-CT96-2062 has financially supported most of the activity. Laboratoire de Recherche des Monuments Historiques (LRMH), Champs-sur-Marne, France, for the fresco samples (Dr. M. Stefanaggi). Benaki Museum, Athens, Greece, for the icon sample (Dr. S. Stassinopoulos). We would like also to thank a lot Mme Veronique Legoux, professional restorer, who prepared the report from which we extracted Fig.5 and spent four long days with us in Paris examining the sample walls; without her precious advice this work would have missed some very interesting observations. We wish to thank also all the people at LRMH and CSTB that helped us in doing our work and especially the people at the canteen of LRMH that created a very warm and friendly ambient. C. Fotakis, V.Zafiropulos, D. Anglos, C. Balas, D. Fandidou, S. Georgiou, V. Tornari, I. Zergioti and M. Doulgeridis, "Lasers in the Conservation of Painted Artworks", in Restauratorenblatter, International Institute for Conservator of Historic and Artistic Works, Eds. E. Konig, W.Kautek (Verlag Mayer & Comp., Vienna, 1998) in press.